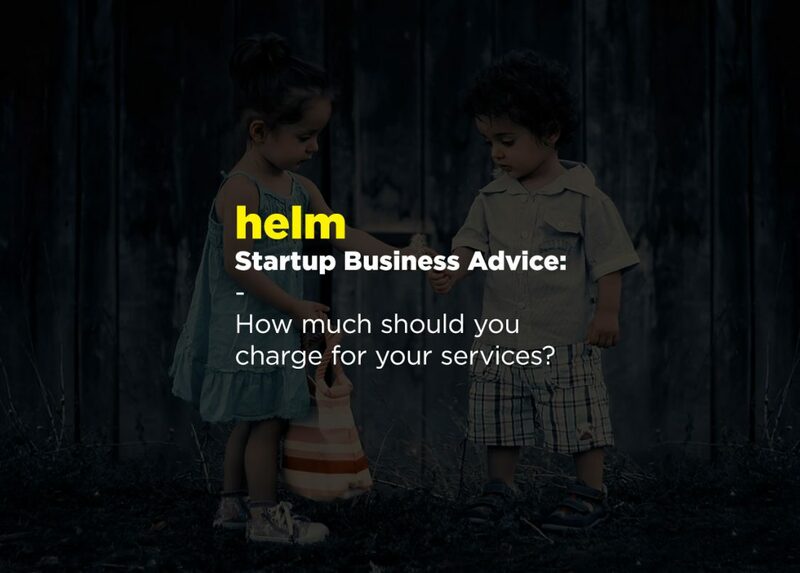 HELM - Shared Office & Coworking | Startup Business Advice: How Much Should You Charge for Your Services? Startup Business Advice: How Much Should You Charge for Your Services? 15 months ago I was where you are now, I’d bitten the bullet and decided to become self-employed. It was pretty much plain sailing until I got my first client and had to decide how much to charge. Until then my main worry was deciding what to offer and finding people to offer it to. I hadn’t really thought beyond this. A few things crossed my mind, my instinct was to jump in with a really low price because I really needed this first client to validate that I actually had a functioning business. Then I thought that if my price was too low they might not take me seriously and think I’m a cheap option. Plus, how could I make any money charging ridiculously low prices? Then I decided that it’s probably better to try and work it out properly rather than guessing. But how did I stop guessing you ask? That’s what I’m going to help you with today. If you’re retro grab a calculator, if not get your phone. I’d say aim to replace your current salary initially. This amount should reflect a figure you’d be happy to live on. Think about your mortgage payments, rent, food, bills etc and a little left for you to enjoy yourself with! As an example, let’s say you want to pay yourself £30,000 a year. Your expenses are what you spend money on for your business each month. This is usually things like insurance, marketing, software subscriptions, travel and rent. I’d work out what you spend each month then multiply this by 12 to get a rough idea of your expenses. As a startup business this probably won’t be much initially, especially if you decide to use Helm as your office space and do a skill swap to cover your rent. For our example let’s assume this figure is £500 a month, so £6,000 a year. Being self-employed or a limited company director means you’re now responsible for the tax you pay. It’s a good idea to find an accountant to help you with this even if you’re just starting out and you don’t think it’s worth it. It is. Especially if you’ve started out as a Limited Company. A good way to work out the amount of tax you’ll pay is to use a tax calculator. I’ve found these work quite well. Self-employed – This tax calculator is great for giving you an idea of the amount of tax you’ll be paying. It even splits it into yearly, monthly, weekly and daily amounts which is great if you want to put a little money aside each month to cover your tax bill. Limited company – For the tax year 2016/17 the most tax efficient salary to draw if you don’t employ anyone is £8060 (a year) or £671 (a month) followed by £679 (in your final month). The rest you should pay yourself in dividends. A great calculator to work out how much tax you’d pay on your dividends can be found here. If we go back to our example of £30,000, a self-employed person would be taxed roughly £2,600 and a company director £1,050. Are you starting to see the benefits of a limited company now? The number of working hours the average person works each year is 8 hours a day, 5 days a week equalling 52 weeks a year. That’s 2,080 hours. You could jump in and use this figure BUT I think it’s wiser to take of some hours for holidays, days you might be ill and days you end up having to take off for your children, moving house etc. A more realistic average would probably be 48 weeks (that gives you 4 weeks to cover a holiday and a few unknowns), totalling 1,920 hours. Now to get an even more accurate estimate you should take off any time that you can’t class as billable. This is time spent finding new clients, doing business admin and other tasks that you wouldn’t directly bill a client for. Take off between 15-20% of your hours for this. For the example we’ll work on 20% of time being non-billable. Work out 20% of 1,920 (364) and take this away from 1,920 leaving 1,536 billable hours. Now you’re getting to the fun bit! You need to add together the amount you’d like to pay yourself, your expenses and your tax, then divide the total by your number of billable hours. BUT you’re not going to stop there. As you know the aim of a business is to make a profit, so you need to add a profit margin on to your hourly rate. This is totally up to you, but work out between 10 – 30% of your hourly rate and add this on. Back to the example, where I’ll add 20%. Self-employed – 20% of £25.13 is £5.02, so the hourly rate is now £30.15 but I’ll round this up to £31 or £32. Limited – 20% of £24.12 is £4.82, so the hourly rate is now £28.94 but I’ll round this up to £29 or £30. So, looking at this you’d be aiming to charge your clients around £30 an hour. If you’re uncomfortable telling a client your hourly rate, you should consider charging on a project basis. Think about how long the project will take you and add your hours up to create your project fee. Remember, this is only a rough guide to get you up and running. You should also check the average rate charged in your industry and position yourself against this. Also, if your monthly earnings and / or expenses rise you’ll have to recalculate a little. Once you get going and grow in experience and confidence you’ll soon find you can charge a bit more. Plus the longer you work with clients, the more you’ll get a feel for how much to charge. If you found this article helpful you might also benefit from one of Helm’s mentoring schemes, or if you just want to come along and take a look at a great co-working space pop round on a Friday between 12-5pm (it’s free).